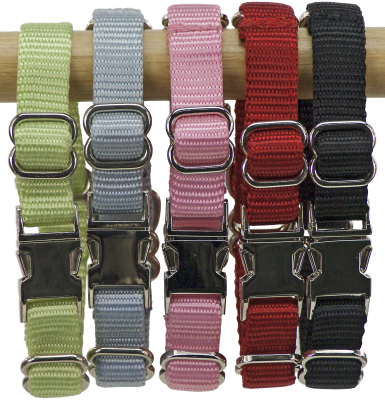 2 Way Adjustable Martingale Collar- 5/8"
The 2 Way Adjustable Martingale Collar is made of heavyweight nylon webbing, has metal hardware and two slide adjustments. It has a metal, contoured side release buckle which we will personalize and engrave for you. For a martingale collar to work properly as a training collar, it must be fitted and worn correctly on the dog. The collar should be worn high on the dog’s neck and sit just behind the ears (see photo). It should fit snugly, and there should be no play in the collar. Once you have the collar set to the size needed, then you can use the side release buckle to take the collar on and off. When the collar is set in this position, it is for training and should not be left on an unattended dog. If you fit it properly, it will take just a small amount of tapping on your leash to tighten the collar for response. Your dog will quickly learn that a little tap of the leash means he/she is to change his/her behavior. To use this training collar, it is important to purchase the correct size for your dog. Measure the dog’s neck just behind the ears.